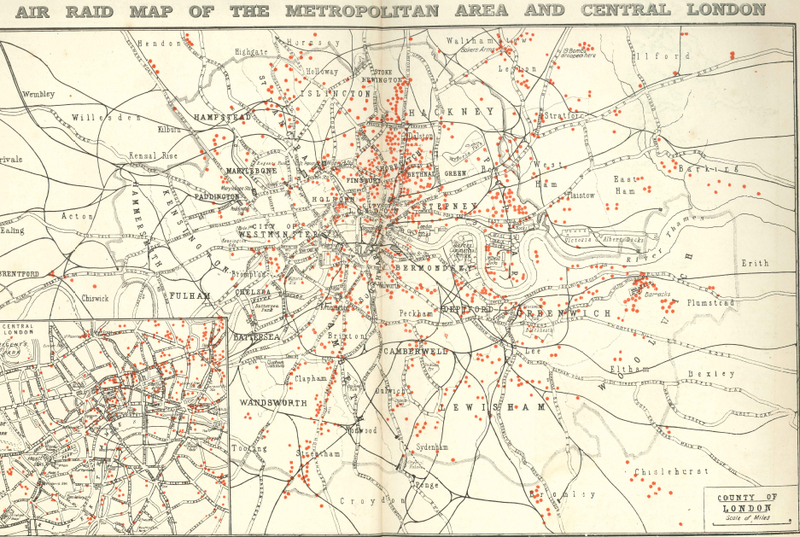 The Great War brought a previously-unknown danger to Londoners – air raids. This brought on challenge unknown in previous wars: how to alert people to the approach (and departure) of raiders. In 1917, with air raids by Gotha bombers increasing in frequency and deadliness, the authorities had to devise a way to warn the population of the approach of enemy aircraft. At the start of July, the Commissioner of Police announced the use of warnings carried by police, giving rise to the curious picture above. Less than two weeks later, on 21 July 1917, further measures were developed. It was announced that three ‘sound rockets’ would be fired in quick succession to warn of air raids on the capital, alongside the display of ‘Take Cover’ notices. 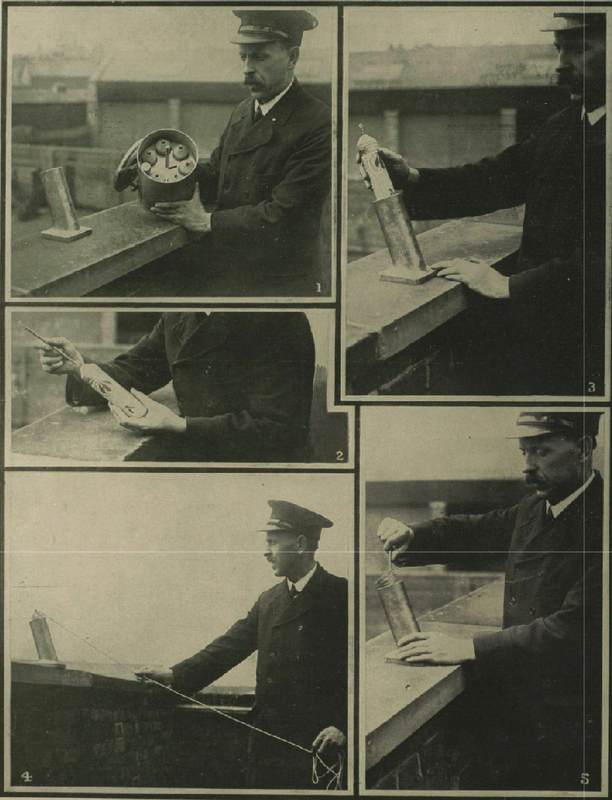 The rockets were to be fired from the tops of all London Fire Stations. The ILN reported the use of this method the next day (alongside the above illustration). As well as the change to two sound rockets, the arrangements were nuanced so that they were automatically to be fired from Fire Stations inside the County of London and but only in other places within 10 miles of Charing Cross if they were felt to be at risk. 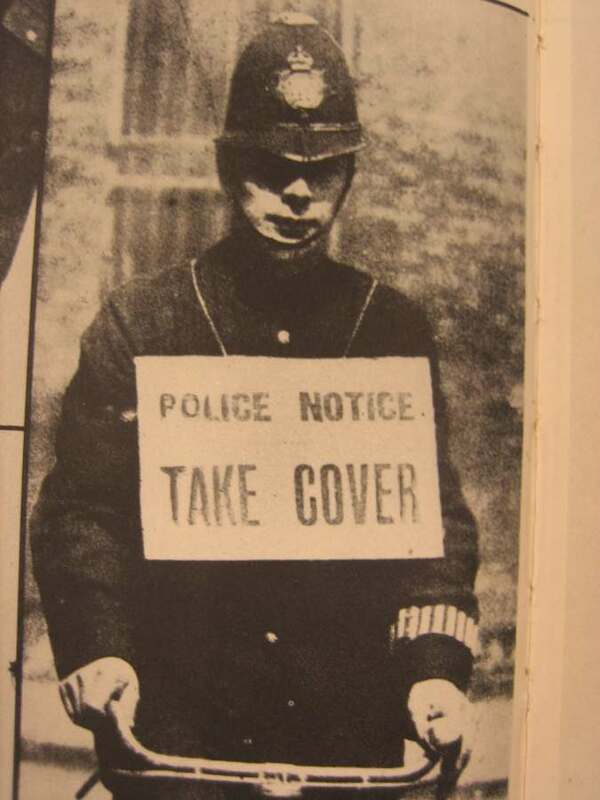 The police would continue to display ‘Take Cover’ notices – now specified to be in red letters. From October, ‘Specials’ carrying these notices began to be issued with steel helmets. ‘All Clear’ messages were also to be given by the police – in black lettering. Late in 1917, this message was accompanied by bugles sounding. 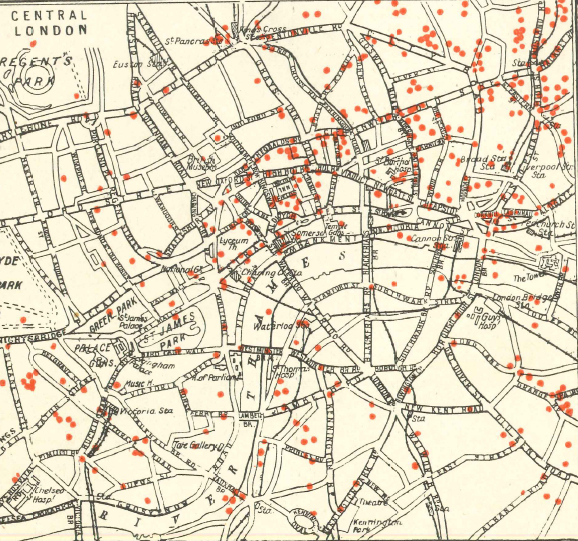 This is not the full history of air-raid warnings during the war, which Neil Hanson tells more thoroughly in his account of the air raids on London – The First Blitz. 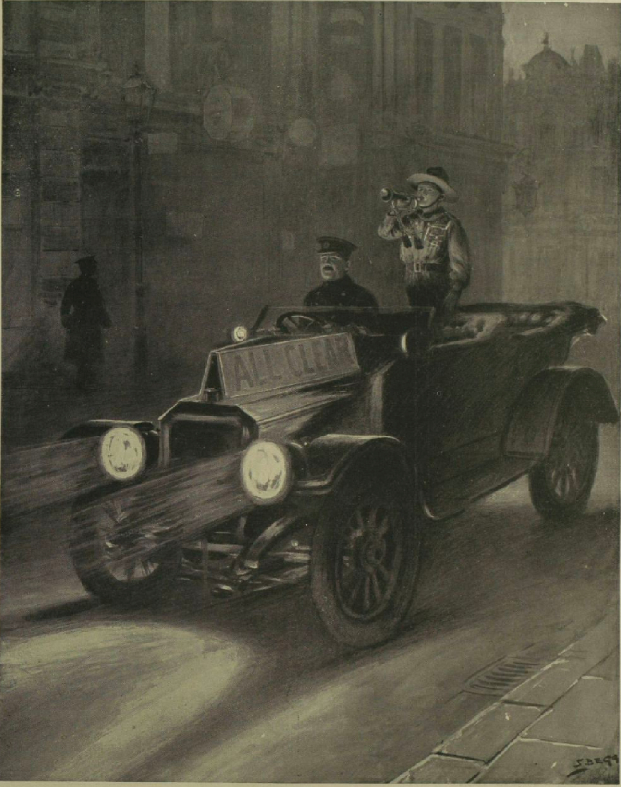 It does, however, show us something of the ongoing development of the civilian experience of war, to which the urgent need to know about an enemy attack was a new development for Londoners in the Great War. The wartime, many of people’s favourite pastimes were curtailed. Professional football was suspended, bank holidays were (temporarily) cancelled, and some of London’s best-loved museums shut their doors. 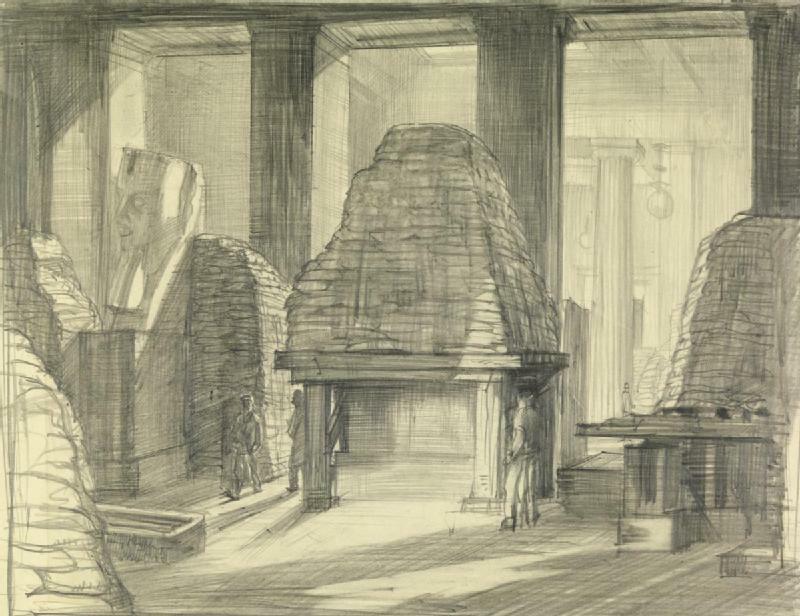 The British Museum closed to the public in March 1916 and did not fully reopen for nearly three years. The British Museum is one of London’s (many) iconic buildings. Free to enter since opening its doors to the public in 1759, it is one of the world’s great museums. In 1914 it still also housed the Reading Room that later became the British Library; it also had a branch in South Kensington that became the Natural History Museum. For the first months of the war the Museum continued as usual, albeit with many of its staff off in the armed forces. By March 1916, 110 British Museum staff (and 53 at the Natural History Museum) were serving in the armed forces, while another 42 were sent to work in other government departments. In November 1914, a series of lectures were held at the Museum in aid of Belgian refugees. In April 1915 a poem by Edward Shillito (published in the Times) described the visit of a wounded soldier to its galleries. In August, the Museum put out a call for regimental magazines to be sent to the Reading Room so that a national collection of them could be kept. In February 1916, the Government announced that several London museums would be closed for the duration of the war – much to the shock and indignation of MPs and writers of letters to the editor of the Times. The National Gallery and Victoria & Albert Museum were not closed, while the National Portrait Gallery had already closed. 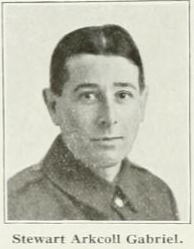 Temporary openings seem to have taken place in August 1917 and again in August 1918, but otherwise the museum remained closed apart from its famous Reading Room. Another big shock hit the Museum’s supporters in the dark days of the winter of 1917-18, when the Government announced that the Air Ministry was to be housed in the British Museum building in Bloomsbury (as part of the expansion of civil service accomodation that had already seen St James’s Park occupied). There was considerable protest in Parliament, in the press and from learned people and groups. After a few weeks of these protests, the Government backed down and announced that the building was “no longer necessary” for housing the Ministry. Handily, it turned out that there was enough room at the Hotel Cecil on the Strand and the Ministry moved there – marked today by a plaque on the site. The British Museum did not remain completely empty, though. 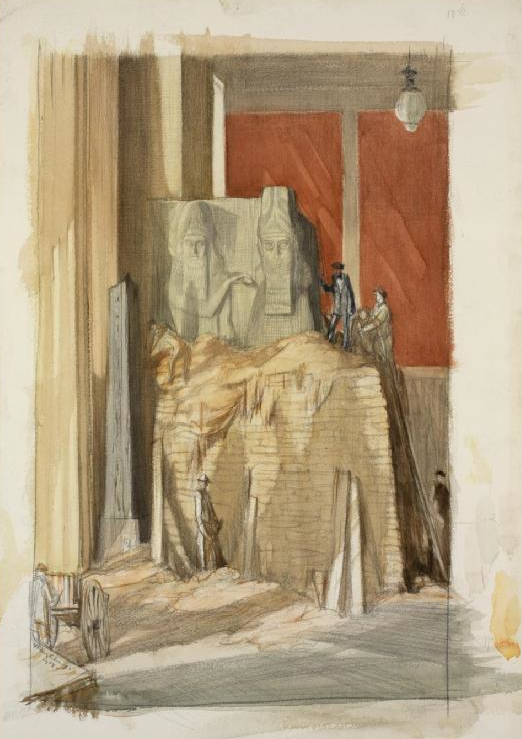 When the war ended and calls came to reopen the closed museums, it turned out that part of the Bloomsbury building was being used by government departments (as were the National Gallery and Portrait Gallery) that had to be moved out at the same time that the Museum was being repopulated with antiquities. The building gradually reopened over that first winter of peace. War returned to the Museum prematurely into the 1920s Great War tank was displayed outside the museum. 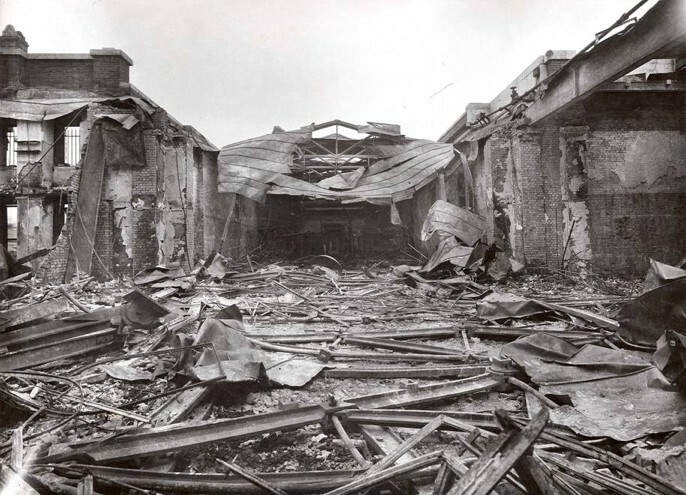 In late August 1939, with another World War virtually inevitable, the Museum was again closed and largely emptied to protect the contents from air raid damage. 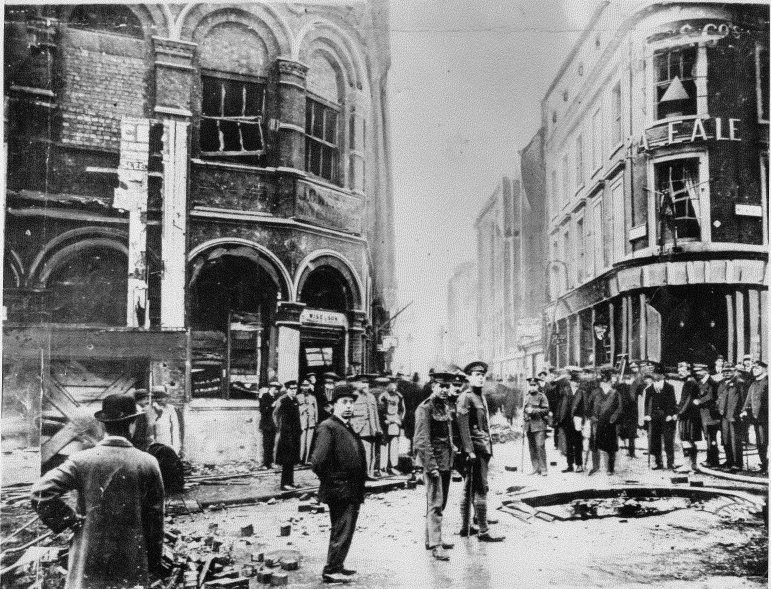 This time around, though, there was not the same protest – and the museum was damaged in the bombing of London.